Based on what you have read or learned from news sources, what did you expect to see in the top five? If you thought of one that is missing, perhaps it is in the top 10. Still, when you look at the numbers, you may be surprised to learn how few people die in a given year, given the size of the US population. My point in this post is that we ought to examine total data instead of being guided by the headlines of news stories and misleading charts when we want to understand a health or social condition. According to the Centers for Disease Control and Prevention, the five leading causes of death in 2017 were heart disease, cancer, unintentional injury, chronic lower respiratory disease, and stroke. 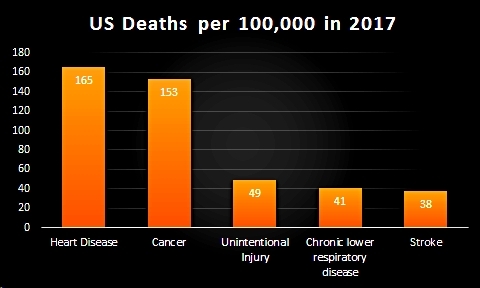 The report includes more causes, but I chose the top five based on the deaths per 100,000 U.S. standard population. When you add the numbers for the five causes, you find the top five causes of death accounted for 445 people out of 100,000 people. Thus, less than 1% of the population died from the top five causes. The chart illustrates a helpful way to report data. Instead of reporting percentages, just give the numbers of people for any condition in relationship to a population value. In this case, the relevant population value is Americans (actually an estimate of the U.S. population based on the 2010 census). It is usually better to report data in terms of how many people with a condition out of 100 people, but as you can see, out of a sample of 100 people, we might have no dead people! 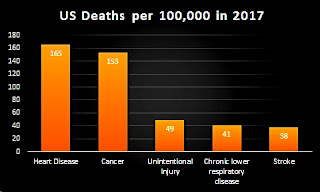 And, fewer than 2 people died of these causes out of 1,000 people! So, it is important to select a population size that makes sense in terms of all the available data. I would like to know how many people died in the United States. It just seems to make sense. If you are going to tell me how many people died out of some portion of the population, why not tell me the total figure? Interestingly, there is a total death figure for 2016, which is 2,744,248. That gives us a death rate of 849.3 people out of 100,000 population. The total population estimate for 2016 is 323,071,342. So, less than 1% of the population died in 2016. They don't tell us how many people are in their estimate of the population-- the last census was in 2010. But they did write that they estimated the 2017 population based on 2010 census data. I did a search and found a census table estimate for 2017 = 327, 147, 121, according to the Census.gov website. The statisticians are pretty good, but it is important to know that we are dealing with estimates. We really don't know how many people died in the USA in 2017. Still, I bet the numbers are good estimates. I don't require absolute certainty when it comes to data about human beings. Anyway, if you are interested, you could estimate the number of people who died in 2017 or, you can wait until the data are provided. Another useful lesson to note here is the lack of scary headlines. We just have the facts reported in a responsible way. There are no news media telling us about this epidemic or another in an effort to sell a story. We know that less than 1 out of 100 people died in 2016 (849 out of 100,000 rounded). If a person had 1,000 friends on social media then, 8 or 9 might have died if, and only if, the friends were similar in age and other relevant variables to people in the general U.S. population. My guess is, any friendship group probably does not represent a proportionate sample of the US population so, we will need to be careful in generalizing about all people based on our friendship groups. If you were going to write that we have an epidemic based on the number of people dying, what figure would you say is worthy of the term epidemic? The dictionaries are not helpful because they refer to an epdemic as a "widespread" problem such as a disease. Truly, 1% of almost 330 million people is a lot of human beings. The number of people who did not die is of course the reverse so, more than 99% did not die. The death rate increased 100% when two people die this year compared to one person who died last year.